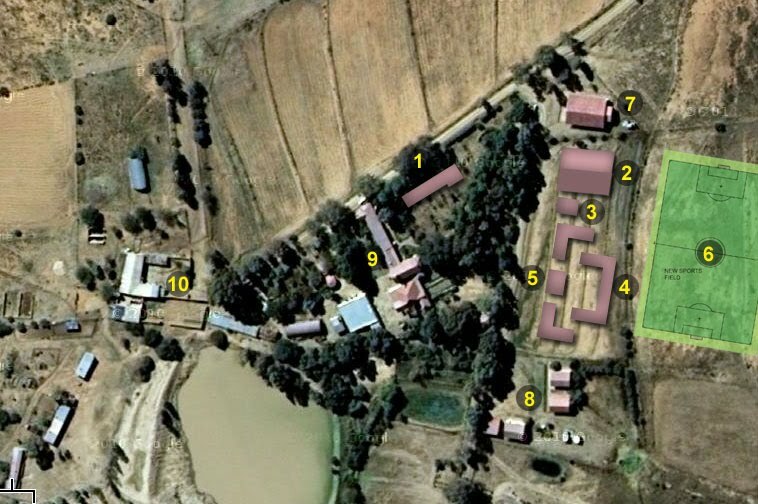 The Diocese of Aliwal has transformed the Farm Mount Carmel, a gift of the Sisters of the Holy Cross (Menzingen, Luzern), into a Diocesan Pastoral Centre that focuses on the work with youth and children and the people who care for them as an adult formation Centre, in particularly for the training of leaders and Small Christian Communities. This is where all the workshops and meetings are held. It can host up to 200 participants and has the facilities of a fully functional conference room. This is right next to the conference room and it is were meals are served. It has a seating capacity of 200.The dining hall is equipped with an industrial kitchen where all the meals are prepared. A block of four dormitories which can accommodate 64 participants, each room accommodating four people. The rooms are equipped with an ensuite bathroom which has a shower and the enviro toilet. This is also part of the youth accommodation block where the supervisors who would have come with the young participants reside. It consists of 2 units both with ensuite bathrooms and a lounge in between where the supervisors can lounge after a long day in the workshops. A fully equipped laundry where all the washing and ironing is done. The tuchshop is where all refreshments, airtime and other basic needs for a traveller are sold. It has been converted to 5 bedrooms with ensuits where each room accommodates 2 participants. Please follow link to see pictures.